Hamtramck, at just 2.1 square miles, urban life flourishes here. Perhaps it’s the mix of cultures, customs, religions and ethnicities; immigrants from all over the world have settled here for centuries. Maybe it’s the result of the blue-collar work ethic Detroit is so famous for or the authentic everydayness of life in this enclave. 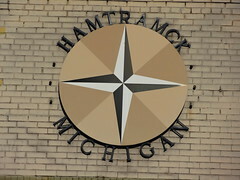 Whatever it is, let’s face it, Hamtramck is cool! Today is the 2014 Neighborhood Arts Festival, it’s not like any other ‘festival’ we’ve ever been to. 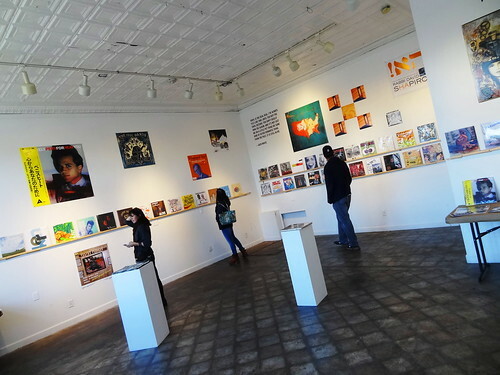 Activities are taking place from one end of the city to another in storefronts, lofts, galleries and homes; from music to dancing, painting to printing, there’s something for everyone. Being an afternoon event, we arrive on Jos Campau just in time for lunch; the longstanding Campau Tower has just re-opened. 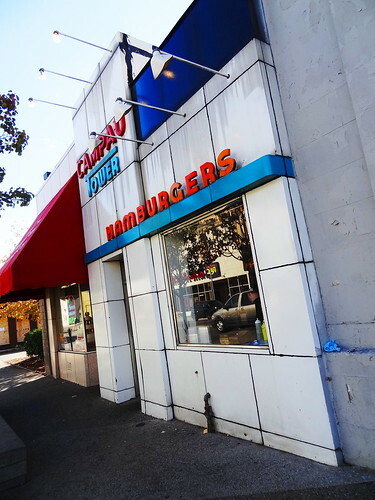 Serving burgers, hot dogs and milk shakes, it’s sure to be a hit with the locals. The diner is teeny-tiny, we grab the last empty stools, leaving standing room only, the menu hangs above the grill, one of those old-fashioned numbers with the white letters that press into a black felt background, there’s a lot to read. Besides a good scrubbing and some freshening up the restaurant looks the same as it always has. 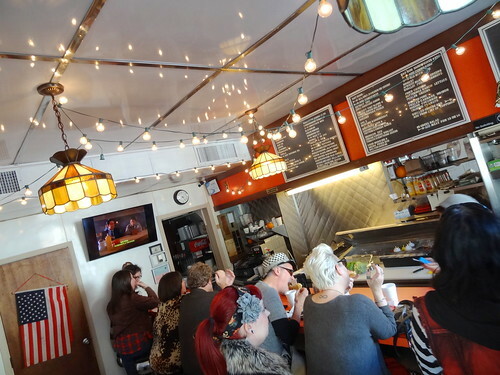 Now, white cafe lights criss-cross the ceiling, a flat screen TV mounted on the wall shows an old episode of Twin Peaks, stained glass lamps dangle by chain from the ceiling. People stop in placing carry-out orders, it’s a busy day at the Tower. 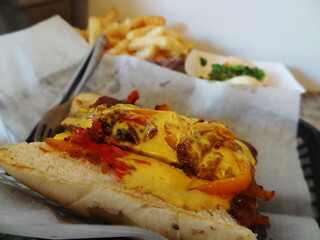 Our food finally appears, the Brotherly Love hot dog, which looks amazing, brisket Bao Bun and fries. Unlike the service, the food was really good; the hot dog is split then covered with caramelized onions, peppers and cheese sauce…yum. The apricot brisket bun, tiny and tasty. The menu selection runs from the expected to the adventurous. Now let’s check out the festival! Atomic Cafe Art Gallery is right across the street; the space is long and narrow, black paint covers the walls in the first gallery, a ping-pong table takes residence near the back, a couple is playing as we look at the art. 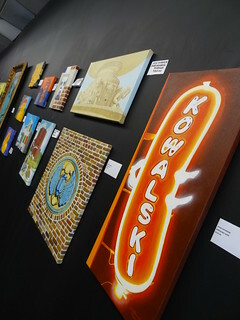 Paintings are bright and colorful, some cartoon-like, near the back, toilet seats are covered in colorful Marvel Comics and shellacked to a high shine, another grouping depicts Detroit scenes: Scarab Club, Belle Isle fountain, the infamous Kowalski hot dog sign. Through an open doorway we enter the next gallery; Kris and I both walk towards the same piece, 12 boards are covered in a highly textured coating, each piece is a different, brilliant color, it’s hard not to touch. 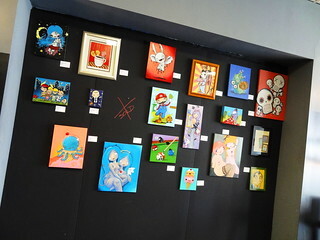 A number of artists are represented, the variety of styles and pieces is welcome, cool, old items have been upcycled into lights, there’s a little bit of everything. 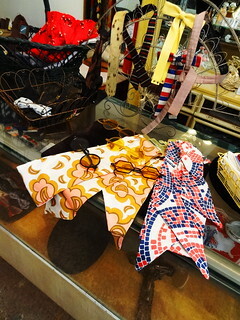 A few steps away we drop in at Lo & Behold, the shop has an ever-changing inventory of neat things. 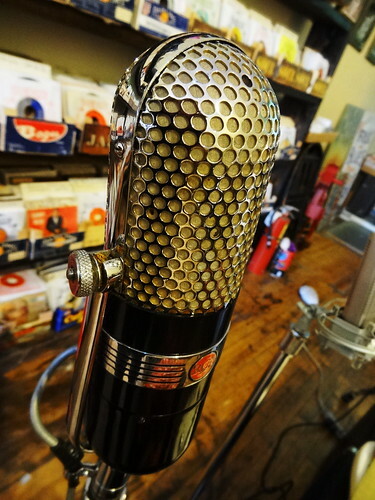 Kris spots a gorgeous 1940’s microphone, I follow his lead to have a look, it’s a beauty. The shop is fully stocked with vintage 45’s and record albums today, they also offer cassettes of artists who perform here. I make a note reminding us to come for the live music this winter. Tekla Vintage is one of those funky vintage stores that offers everything from home goods to handbags, it’s owned by Hamtramck Mayor Majewski. 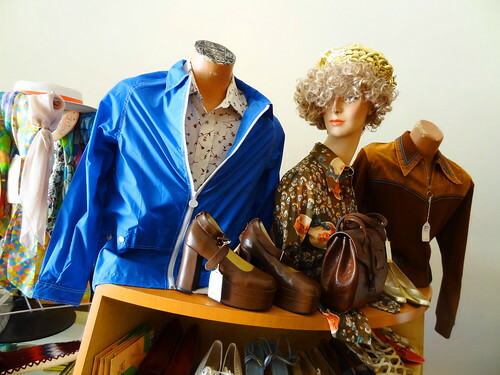 The store is brimming with wild fashions from the 60’s and 70’s, there’s no shortage of polyester here; one look at a pair of platform shoes makes me laugh out loud, literally…. Glass and mirrored shelves hold lovely Polish items such as dolls, plates and vases. Styrofoam heads wear fashionable hats, guys, you can find a great bow tie here. Some of the fixtures and display cases look original to the store, I’m crazy about the glass front doors with the lucite handles. Continuing on Jos Campau there’s an open studio up on the second floor of a building, Carl Wilson and Mariuca Rofick have their work on display. 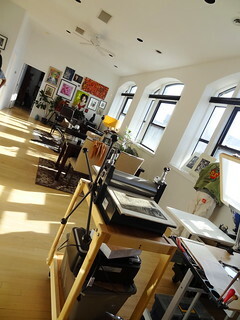 Light pours in from large front windows, art covers the walls, we love getting a peek into these great spaces. 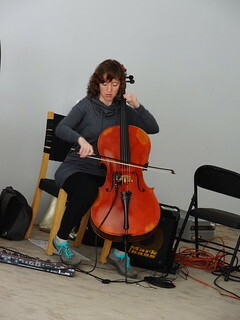 At the 9338 Campau Gallery Abigail Alwin plays her cello, visitors are gathered around in the large open room. She plays her instrument and works a series of pedals which allow her to record, then play back a piece of music, looping it so she can add to it, creating a piece with many different parts. 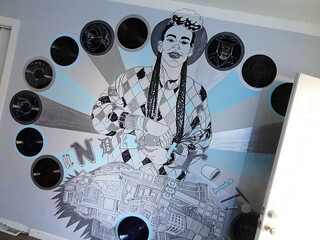 Over on Caniff, Public Pool has an exhibit titled “The Last Record Shop”, we have been looking forward to seeing it. 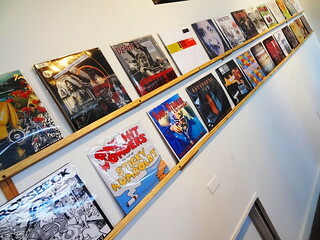 Fashioned to look like a record shop, quotes from musicians are painted on the wall, album covers rest on shelves and tables. 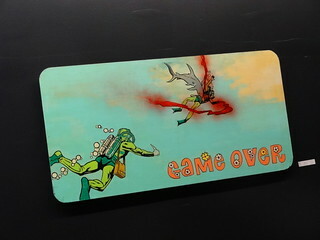 You must take your time to look at the cover art, satirical and clever, they are great fun. Next we make our way into the neighborhood. 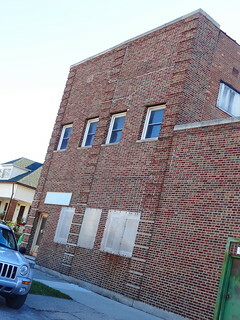 A large brick building on Klinger is home to artists studios and Silva Perum Bookstore. When we arrive, adults are guiding children in a number of activities, one man teaches how to ride a skateboard, in the yard kids are drawing and making Halloween masks. 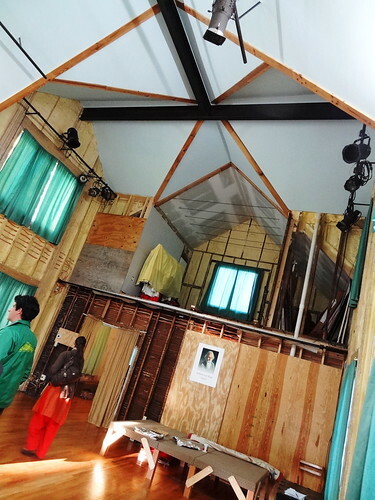 Inside we traverse the halls, popping into individual studios, so much amazing stuff goes on here. Time is fleeting and there are still so many things to see; we make our way to Sobieski St.
A simple, white, 2-story house sits non-nonchalantly, a closer look reveals a series of paintings surrounding the front door. We are welcomed inside by the homeowner who tells us this is her hobby house, a place where she can create, display her art and entertain. She shares the space with another artist, the house is cozy, quaint and a great way to share their talents with the public. 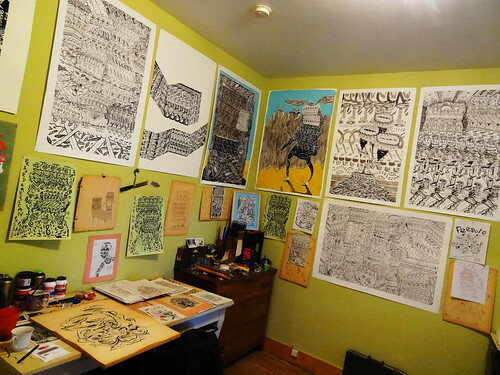 Down a ways, we enter the second story home/studio of artist Emily Wood. The hall going up is lined with her framed art, her studio is jammed packed with her work in every medium from paint to pottery to sewing. 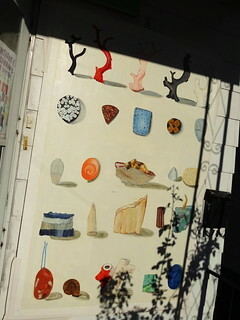 Kris and I are both in awe of her talent, her painted streetscapes are so life-like. 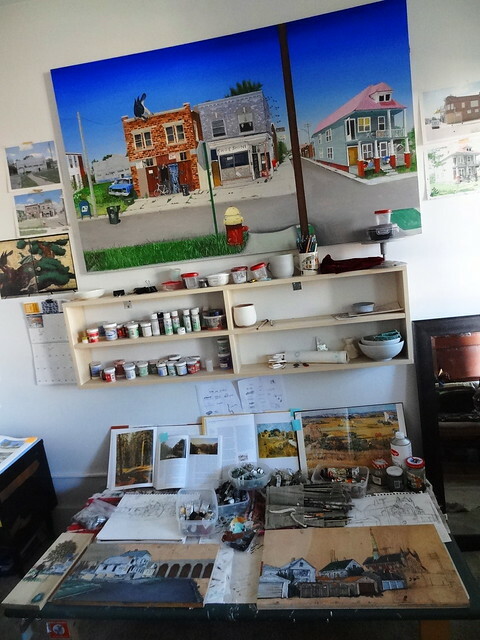 The front room is cluttered with bottles of paint, brushes and works-in-progress, a panel of material sits on a table, the print is her very own drawings of houses in Hamtramck, sweet! 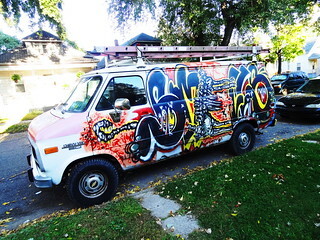 We make our way to a quirky little neighborhood in the North end of Hamtramck, a graffiti covered van sits curbside outside the studio of Will C Bevan, a Memphis native who spent the last year in New York before moving to Detroit. 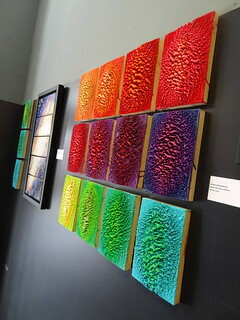 His work on display is a series of abstract patterns, very appealing to the eye. 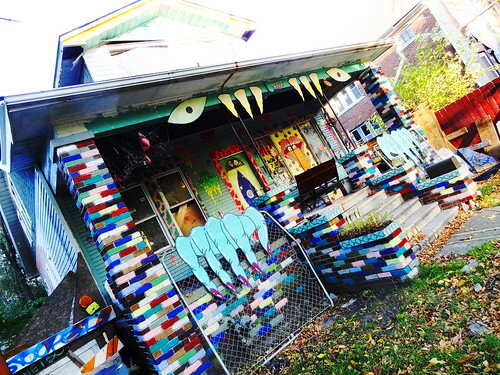 It blows our mind to think of what an artistic hub Hamtramck has become, who would’a thought? 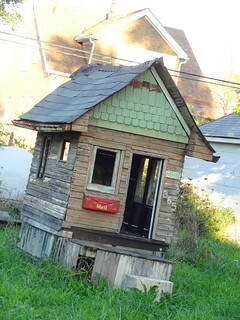 Filter Detroit is an artist residence owned by a woman who resides in Germany… For 4 months a year, an artist lives rent free in the back portion of the house, in exchange they must make/leave some sort of contribution, print a book, write a poem, do a painting; in the front room of the house is such a piece, one of the traveling artists created a mural depicting Detroit. 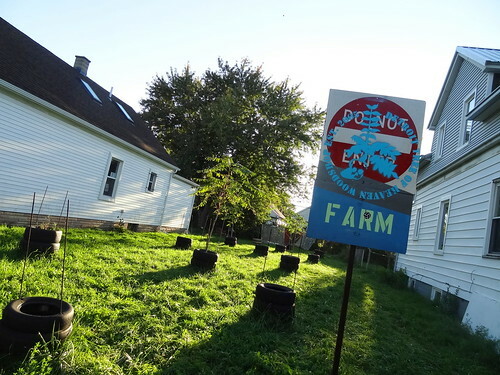 An empty lot has become a tree farm of sorts as saplings sprout from the center of old tires.The house next door is called Play House, and for good reason; the house has been completely gutted of interior dividing walls and floors and has become a performance space. We enter from the backyard and find ourselves in a lovely hardwood floor room, a Classical Bengali music concert has just ended, the folks who own the house own several properties on the street, they have big plans for all of them! 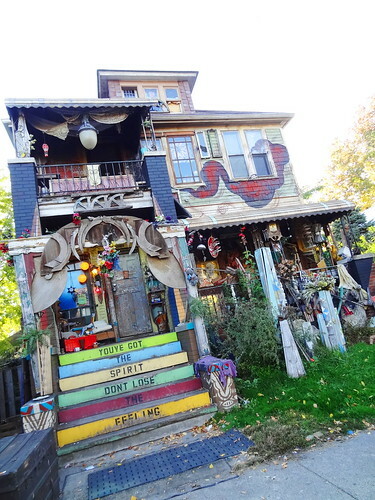 Walking to the end of Moran we see Treasure House, an old 1920’s home, somewhat of a living collage; steps are multi-colored, art pieces, random objects and found items cover the surface, lean against the porch and take up space on the lawn. Across the street an ordinary house has become a monster house; eyes, fangs and large hands make one wonder what’s inside. The structure is colorful, and oh so interesting with painted globs of slime dripping down the front. 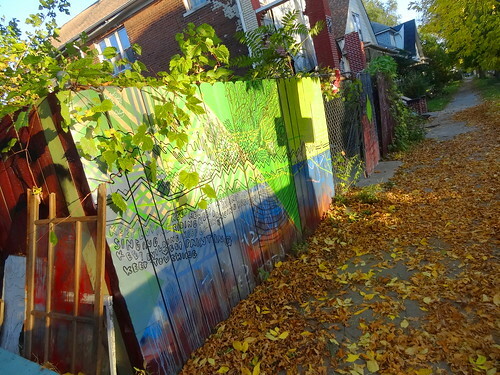 Even the fences are tied into the overall artistic statement of the neighborhood, painted up in bright hues, they are aglow in the late afternoon sun. Written words remind us to Keep Singing, Keep Learning, Keep Loving, loose windows and building materials are strewn about. Another house has this awesome life-like painting of a man, it looks as though he is working on repairing the house right this minute, windows are boarded up, random patterns are drawn on the wood. 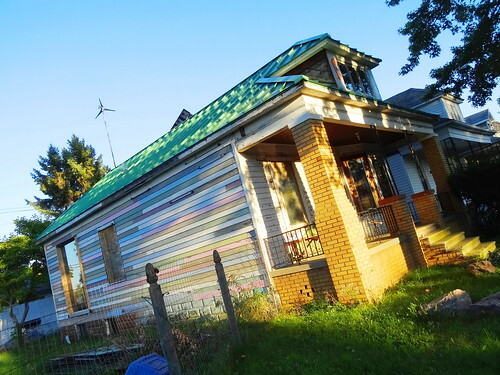 Power House is another public art project, the goal here is to have the house completely functional off the grid. It currently creates its own electricity from wind and solar energy. With so much positive going on in and around Detroit it always makes me wonder why it’s such a secret. 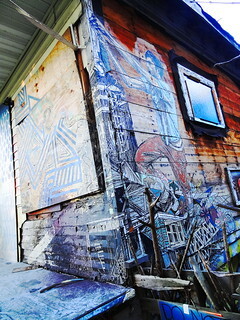 Thankfully, events such as the Hamtramck Neighborhood Arts Festival allow us to find the amazing behind the perception.